Wannabe – informal –noun - a. a person who desires to be, or be like, someone or something else. Weaver – noun - a person who weaves. I figure wherever we are in our writing journey, we’re wannabe’s. The unpublished writer’s greatest desire is to be published and the published writer dreams of being a bestseller and having their work duly recognized. On my part, I want two things. Yes, I’d love to be a bestselling writer, but I also want people to recognize me as a good writer, one whose stories leave the reader with something to think about after the story is finished. But before this step, we writers do our fair share of weaving – we’re story weavers. It ain’t easy to take character, plot, point-of-view, setting, theme and combine these into something that becomes an admirable piece of craft. We have to take each strand, apply our knowledge and individual style, and then plait them together in such a way that our readers will think it worth their while to take a 300 page journey with us. What dreams do you have for your writing career? Are you gathering the necessary tools that will ensure you can weave your stories together seamlessly? As to W foods, we don’t have any dishes I can think of readily. There is won ton soup, but we mostly have this as a menu item at Chinese restaurants. There is also the watermelon, which we have year round. 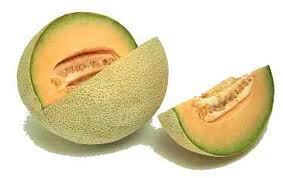 We have cantaloupe as well, but don’t ask me how it got here. It isn’t widely grown and in general, Jamaicans prefer the regular watermelon, which might be a case of sticking to the evil that we know. Good job with both the 'w' word and the 'v' word. I read them both. 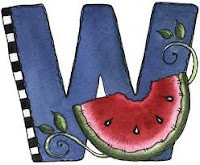 I love watermelon and on occasion I read it veraciously. Hehe. I would imagine it may be difficult to attend a writer's conference from Jamaica. Do you have any locally? Love love watermelon in summertime! I have small writing dreams, which is just publish anything at all. And I have big writing dreams which of course is being multi-published! Nancy, we don't have writers' conferences that I know about. We do have seminars from time to time, but nothing of the depth that you have in the States. Laura, yes, watermelon is refreshing, Hang on to those dreams because all things are possible if we believe. Julie, believing in what we do is important. Mmmm...Watermelon. Beef Wellington doesn't count? No I guess not. I'm always trying to gather tools that will help me to weave my stories. I'm a weaver too. That's how I know I'm gonna be. I'm a wannabe, I just don't know what I wannabe yet! Thanks for stopping by my blog. Lauracea,Beef Wellington is not part of our regular fare here. Love watermelon too. You better get moving on that novel. Cythia, like you, I'm always trying to better what I do. Robyn, a body's gotta have ambition and lots of it! Bish, glad I stopped by. It's never too late to decide. Weaving...what we all try to do artlessly with our words, out feelings and our hearts. Another great post and it made me hungry for watermelon. great words for sure! and who doesn't love watermelon and canteloupe--they're especially good during the summer months. I like the weaving analogy. This is so true. My dreams... I guess I want to leave people thinking and wanting to be better. I want to get publishes as well that is my next goal. Jeanne, some watermelon would be cool right now. It's still and hot here now. Josh, important dreams and goals.